Developed by Marc Chaikin, the Accumulation Distribution Line is a volume-based indicator designed to measure the cumulative flow of money into and out of a security. Chaikin originally referred to the indicator as the Cumulative Money Flow Line. As with cumulative indicators, the Accumulation Distribution Line is a running total of each period's Money Flow Volume. First, a multiplier is calculated based on the relationship of the close to the high-low range. Second, the Money Flow Multiplier is multiplied by the period's volume to come up with a Money Flow Volume. A running total of the Money Flow Volume forms the Accumulation Distribution Line. Chartists can use this indicator to affirm a security's underlying trend or anticipate reversals when the indicator diverges from the security price. There are three steps to calculating the Accumulation Distribution Line (ADL). First, calculate the Money Flow Multiplier. Second, multiply this value by volume to find the Money Flow Volume. Third, create a running total of Money Flow Volume to form the Accumulation Distribution Line (ADL). The Money Flow Multiplier fluctuates between +1 and -1. As such, it holds the key to the Money Flow Volume and the Accumulation Distribution Line. The multiplier is positive when the close is in the upper half of the high-low range and negative when in the lower half. This makes sense, as buying pressure is stronger than selling pressure when prices close in the upper half of the period's range (and vice versa). The Accumulation Distribution Line rises when the multiplier is positive and falls when the multiplier is negative. The multiplier adjusts the amount of volume that ends up in the Money Flow Volume. Volume is in effect reduced unless the Money Flow Multiplier is at its extremes (+1 or -1). The multiplier is +1 when the close is on the high and -1 when the close is on the low. All volume is positive when +1 and all volume is negative when -1. At .50, only half of the volume translates into the period's Money Flow Volume. The table below shows the Money Flow Multipliers, Money Flow Volume and Accumulation Distribution Line for Research-in-Motion (RIMM). Notice how the multiplier is between .50 and 1 when the close is strong and between -.50 and -1 when the close is weak. Click here for a calculation of the Accumulation Distribution Line in an Excel Spreadsheet. The Accumulation Distribution Line is a cumulative measure of each period's volume flow, or money flow. A high positive multiplier combined with high volume shows strong buying pressure that pushes the indicator higher. Conversely, a low negative number combined with high volume reflects strong selling pressure that pushes the indicator lower. Money Flow Volume accumulates to form a line that either confirms or contradicts the underlying price trend. In this regard, the indicator is used to either reinforce the underlying trend or cast doubts on its sustainability. An uptrend in prices with a downtrend in the Accumulation Distribution Line suggests underlying selling pressure (distribution) that could foreshadow a bearish reversal on the price chart. A downtrend in prices with an uptrend in the Accumulation Distribution Line indicate underlying buying pressure (accumulation) that could foreshadow a bullish reversal in prices. The Accumulation Distribution Line and On Balance Volume (OBV) are cumulative volume-based indicators that sometimes move in opposite directions because their basic formulas are different. Joe Granville developed On Balance Volume (OBV) as a cumulative measure of positive and negative volume flow. OBV adds a period's total volume when the close is up and subtracts it when the close is down. A cumulative total of this positive and negative volume flow forms the OBV line. This line can then be compared with the price chart of the underlying security to look for divergences or confirmation. As the formula above shows, Chaikin took a different approach by completely ignoring the change from one period to the next. Instead, the Accumulation Distribution Line focuses on the level of the close relative to the high-low range for a given period (day, week, month). With this formula, a security could gap down and close significantly lower, but the Accumulation Distribution Line would rise if the close were above the midpoint of the high-low range. The chart above shows Clorox (CLX) with a big gap down and a close near the top of the day's high-low range. OBV moved sharply lower because the close was below the prior close. The Accumulation Distribution Line moved higher because the close was near the high of the day. Trend confirmation is a pretty straight-forward concept. An uptrend in the Accumulation Distribution Line reinforces an uptrend on the price chart and vice versa. The chart below shows Freeport McMoran (FCX) and the Accumulation Distribution Line advancing in February-March, declining from April to June and then advancing from July to January. The Accumulation Distribution Line confirmed each of these price trends. Bullish and bearish divergences are where it starts getting interesting. A bullish divergence forms when price moves to new lows, but the Accumulation Distribution Line does not confirm these lows and moves higher. A rising Accumulation Distribution Line shows, well, accumulation. Think of this as basically stealth buying pressure. Based on the theory that volume precedes price, chartists should be on alert for a bullish reversal on the price chart. The chart above shows Nordstrom (JWN) with the Accumulation Distribution Line. Notice how it is easy to compare price action when the indicator is placed “behind” the price plot. The indicator (pink) and the price trend moved in unison from February to June. Signs of accumulation emerged as the indicator bottomed in early July and started moving higher. JWN moved to a new low in late August. Even though the indicator showed signs of buying pressure, it was important to wait for a bullish catalyst or confirmation on the price chart. This catalyst came as the stock gapped up and surged on big volume. A bearish divergence forms when price moves to new highs, but the Accumulation Distribution Line does not confirm and moves lower. This shows distribution or underlying selling pressure that can foreshadow a bearish reversal on the price chart. The chart above shows Southwest Airlines (LUV) with the Accumulation Distribution Line peaking two months ahead of prices. The indicator not only peaked, but it also moved lower in March and April, which reflected some selling pressure. LUV confirmed weakness with a support break on the price chart and RSI moved below 40 shortly afterward. RSI often trades in bull zones (40-80) and bear zones (20-60). RSI held in the bull zone until early May and then moved into a bear zone. The Accumulation Distribution Line is an indicator based on a derivative of price and volume. This makes it at least two steps removed from the actual price of the underlying security. Moreover, the Money Flow Multiplier does not take into account price changes from period to period. As such, it cannot be expected to always affirm price action or successfully predict price reversals with divergences. Sometimes there is a disconnect between prices and the indicator. Sometimes the Accumulation Distribution Line simply doesn't work. This is why it is vitally important to use the Accumulation Distribution Line, and all indicators for that matter, in conjunction with price/trend analysis and/or other indicators. The Accumulation Distribution Line can be used to gauge the general flow of volume. An uptrend indicates that buying pressure is prevailing on a regular basis, while a downtrend indicates that selling pressure is prevailing. Bullish and bearish divergences serve as alerts for a potential reversal on the price chart. As with all indicators, it is important to use the Accumulation Distribution Line in conjunction with other aspects of technical analysis, such as momentum oscillators and chart patterns. It is not a standalone indicator. The Accumulation Distribution Line is available in SharpCharts as an indicator. After selecting, the indicator can be positioned above, below or behind the price of the underlying security. Positioning “behind price” makes it easy to compare with the underlying security. Chartists can also add a moving average to the indicator by using the advanced options. Click here for a live chart with the Accumulation Distribution Line. This scan starts with a base of stocks that are averaging at least $10 in price and 100,000 daily volume over the last 60 days. Potential bullish divergences are found by looking for stocks where price is BELOW the 65-day SMA and 20-day SMA, but OBV and the Accumulation Distribution Line are ABOVE the 65-day SMA and 20-day SMA. This scan starts with a base of stocks that are averaging at least $10 in price and 100,000 daily volume over the last 60 days. Potential bearish divergences are found by looking for stocks where price is ABOVE the 65-day SMA and 20-day SMA, but OBV and the Accumulation Distribution Line are BELOW the 65-day SMA and 20-day SMA. For more details on the syntax to use for Accumulation Distribution Line scans, please see our Scanning Indicator Reference in the Support Center. Note: For the purposes of scanning, daily volume data is incomplete during the trading day. When running scans with volume-based indicators like Accumulation/Distribution, be sure to base the scan on the “Last Market Close.” Examples of other volume-based indicators include Chaikin Money Flow, On Balance Volume, and the PVO. John Murphy's Technical Analysis of the Financial Markets covers it all with explanations that are simple and clear. 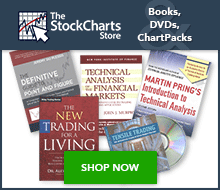 Murphy covers most the major charts patterns and indicators. A complete chapter is devoted to understanding volume and open interest.